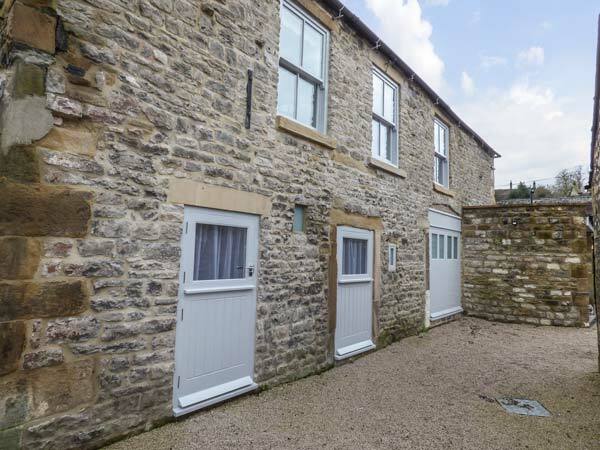 Bank House Mews is a stunning three storey barn conversion in the centre of Bakewell. This property sleeps nine people in three bedrooms, consisting of one ground floor zip/link super king-size double bedroom with additional pull-out stacker bed, Smart TV and en-suite bathroom, a second floor king-size double with en-suite shower room and a second floor family room with two king-size doubles. This property also has an open plan living area with kitchen, dining area and sitting area with balcony. There's also covered off road parking for one small car (not suitable for large, 4 x 4 or estate cars), roadside parking (75 yards, restricted to 2 hours but free after 6pm) and a public car park (400 yards, daily fees apply) nearby. There is also additional parking by arrangement. Bank House Mews is a wonderful base for a Peak District holiday. Over three floors. Three bedrooms: 1 x ground floor super king-size double (zip/link, can be a twin on request) with additional pull-out stacker bed, Smart TV and en-suite freestanding bath, hand-held shower, walk-in shower, basin and WC, 1 x second floor king-size double with en-suite walk-in shower, basin and WC, 1 x second floor family room with 2 king-size doubles (zip/link, can be 4 singles on request). Ground floor basin and WC. Second floor basin and WC. Open plan living area with kitchen, dining area and sitting area with woodburning stove and balcony. Utility room with Belfast sink.